On first reading the above, we might be tempted to say, "Not fair!" For those of us brought up on the precepts of democracy, where everyone is supposedly equal, taking away from someone who doesn't have, to give to someone who does, seems wrong. In context, though, we see this parable Jesus told is a story about taking responsibility for what one has. It's a story about being a good steward of something one has been entrusted with, and being rewarded for that. Maybe, when he saw the others entrusted with multiples of what he got, he thought, The master sure doesn't think much of me by giving me only one mina. I must be lacking in some way. Then he let his lack of confidence immobilize him. Maybe he was a man who just didn't like to take risks. It's ironic, though, that by refusing the do the most unrisky thing — deposit the mina in a place where it could at least earn interest — he was putting himself at the greatest risk of all. Perhaps he thought, This small amount is so insignificant when compared with what the others have been given, it doesn't really matter what I do with it. Jesus reports the servant's reply when the King asks him to explain his investment paralysis: "I feared you because you are an austere man..." Could that reveal his underlying fear of doing it wrong? So, because he wasn't sure he could do this exactly as the king expected, he didn't do anything? This king was hated. Maybe the servant — independent thinker that he was — decided to show the king that he didn't give a fig for his kingdom, didn't want to play the king's game and showed it by treating the master's gift with indifference and disdain. The above is speculation, of course. But these are all reasons we don't invest our minas — the gifts and talents with which we were born — in the Kingdom of God. This parable has been a significant one in my life. It is one of the reasons why, a few years ago, I decided to take up writing in a more serious way. What is your mina? Have you invested it in God's Kingdom, or used one of the excuses, above, to hide it away in a handkerchief? PRAYER: Dear God, help me to be a good steward of all You have given me. Amen. 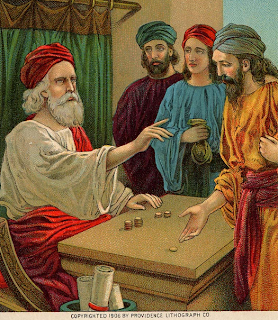 A mina (called a "talent" in a similar story Jesus told recorded in Matthew 25:14-29) was a weight equal to 50 shekels (according to a footnote in my Bible). Here it refers to approximately a pound of money. Each minah (Hebrew) was worth about three months' salary, not an insignificant sum if you think of it in term's of today's wages.